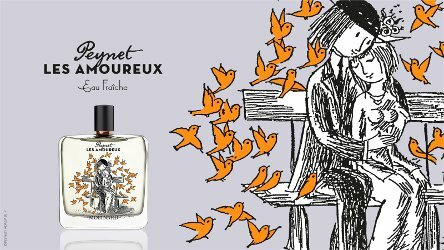 French perfume house Molinard recently launched Les Amoureux de Peynet, a fragrance inspired by French illustrator Raymond Peynet. That name didn't mean anything to me at first, but once I did a quick search, I realized I'd seen those "lovers" before. Peynet first sketched the duo of the wispy-haired, bowler-hatted violinist-poet and his perky lady-love in 1942, but they appeared in his artwork and on countless trinkets throughout the 1950s and 1960s. (Just check eBay, and you'll see what I mean.) The lovers often appeared together on a park bench — that is, when they weren't canoodling in a gazebo, a rowboat, or some similarly whimsical venue. To get back to my point, I must have seen some Peynet collectible at a family member's home or a friend's house in my youth, because they look very familiar. And here they are on the bottle for their very own perfume, "a fresh and sparkling fragrance, with delicate spicy notes of ginger." It was developed for Molinard by perfumer Mathieu Nardin and its composition includes top notes of bergamot, mandarin, grapefruit and verbena; heart notes of petitgrain, ginger, nutmeg and jasmine; and base notes of woods, vetiver, amber and musk. Fortunately, Les Amoureux de Peynet (the fragrance) is less cloying than the original lovers (sorry, Peynet fans!). It's a sheer and wearable citrus-spice scent with a few floral notes woven in, and it could be worn by men or women. It starts off with lots of bitter orange and petitgrain, so its citrus side is sharp and twiggy, rather than juicy. I've especially been enjoying the ginger heart of Les Amoureux. I haven't tried a ginger-centered perfume in a long time — there aren't many around, are there? — and this ginger is piquant but airy. It's warming (just like real ginger root) and comforting, but not in the typical gourmand way. There are some subtle jasmine and rose notes hovering around the ginger, but spice is definitely the main idea here. The base of Les Amoureux de Peynet is still gingery, with some contemporary smooth sandalwood and clean musk notes. The fragrance wears very decently for an "eau fraîche" and it could easily be pulled off by men as well as women. All in all, nothing groundbreaking, but it's cheerful and smart and easy to enjoy. Also, I have to admit that the bottle is adorable. It definitely captures "les amoureux" at their best. Bonus fact: Peynet's lovers have a perfumed past. Peynet created advertisements and packaging for Schiaparelli's Succès Fou in 1953, incorporating "les amoureux." You can see a few examples here. Molinard Les Amoureux de Peynet is $59 for 100 ml Eau Fraîche at Beautyhabit in the US. In the UK, try Allbeauty. Thank you, N! I remember that Origins fragrance, too…and I used to like Caron’s ginger/licorice fragrance…and of course I love to eat or drink anything flavored with real ginger! My favorite gingery fragrance is Serge Lutens Five O’clock Gigembre.